Wage inequality has increased in many economies in recent decades. Discuss the three leading hypotheses regarding the causes of this increase. What does the empirical evidence tell us about the quantitative importance of each of these factors? The US economy has almost double since the 1970s, and labour productivity has risen over this period. Yet real wages for the median worker hasn’t changed much since the 1970s, and below-median male wages have fallen; showing that the increasing size of the economy hasn’t been fairly distributed. The rise in inequality between high skilled and low skilled workers is particularly pronounced, with Autor finding that households which are composed of university education individuals earned $30,298 more than non-skilled workers in 1979, but this rose to $58,249 by 2012, an increase of 92%. The three leading hypotheses to explain this rising wage inequality are: institutional labour market changes; skill biased technological change; and globalisation which lead to greater international trade. Skill biased technological change is the situation whereby the rise of information technology (and the use of computers) has increased the demand for high skilled workers who are able to use this new technology. We can therefore think of SBTC as causing a rightward shift in the demand for skilled labour, relative to unskilled labour. On its own this would increase the wage inequality between skilled and unskilled workers. However, Goos and Manning and Autor, Levy and Murnane point out that whilst this might be able to explain rising wages for the highly skilled, it doesn’t largely affect the lowest-skilled who aren’t replaced by computers (as it isn’t currently possible to automate their services), but might have a greater effect on the wage differences between those around the 50th decile (the middle classes) and those around the 90th decile (the highly skilled). Similarly, globalisation which led to greater international trade over the period is also likely to have led to a greater demand for skilled labour. If we think of a basic Heckscher-Ohlin model, where countries export the goods which are intensive in the factor which they have an abundance; and we think the North is abundant in high-skilled workers and the South in low-skilled workers, then trade increases wage inequality in the North. This is because in the North, skilled labour is used intensively in the export sector and hence gains from trade, whilst the factor used in the importing industry (unskilled labour) losses from trade. 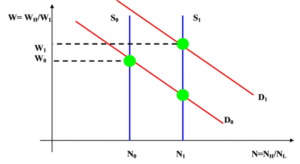 Hence this model correctly predicts rising inequality in the North, however it would suggest declining inequality in the South (unskilled workers are used intensively so there demand should rise and they see wage increases, therefore the difference between skilled and unskilled falls), which is something we don’t observe; potentially invalidating this model. We can easily see that the effect of this would be to increase the wage inequality enormously, but at the same time the college graduate share of the full-time equivalent workforce increased from about 10.6% in 1960 to over 30% in 2005 (Autor, Katz and Kearney) and therefore there must also have been a rightward shift of the supply curve of highly skilled workers. This increase in supply has mitigated rising wage inequality, but highlights that the shift in demand must have been rather large for wage inequality to still be evident despite the enormous increase in supply. The increase in high-skilled relative low-skilled labour supply comes despite the increase in immigration which has caused low skilled labour supply to increase; because returns to education were so high, a lot of people increased their educational attainment, thus bolstering the ranks of the highly skilled. Finally, some authors believe that institutional, non-market, changes in the labour market have led to rising inequality. The two main channels for this to occur are from the declining influence of unions, and the lack of minimum wages. From 1970 the role of unions has declined in the UK (and across the world, although unions have never been particularly prominent in the US), particularly those that cover the lowest-skilled workers. A large proportion of this decline in union power has come from globalisation and the increase in product market competition (Brown). The result of this, is that the lowest skilled workers have been unable to push for higher wages, to keep up with increasing wages of skilled workers, as they have little bargaining power. Obviously this will lead to increasing inequality. Furthermore, before 1990s minimum wages weren’t prevalent in the UK, and they were stagnant in the US, again meaning that the wages of the bottom earners (typically unskilled) were not increasing in line with the increases in those of the top earners. Some authors, such as David Card, believe that these labour market institutions were responsible for the bulk of increasing inequality, however we would therefore expect inequality to fall in 1990s and 2000s when minimum wages picked up (and the decline of union power, although weakened, abated). Furthermore, Autor, Katz and Kearney find little evidence that minimum wages can be responsible for all of the increase in wage inequality, because most of the increase in inequality arose from higher wages of those in the top of the distribution who would be unaffected by the minimum wage, but might be able to partially contribute to the explanation. This entry was posted in MacroEconomics, Other and tagged Globalisation, Inequality, SBTC, Trade, Trade Theory, Wage Inequality, Wages. Bookmark the permalink.